You might recall my fascination with cocaine (no, not for that reason), which culminated in a total synthesis of its enantiomer, (+)-cocaine, using our 2-azaallyl anion chemistry (Mans and Pearson, 2004, blog post here). 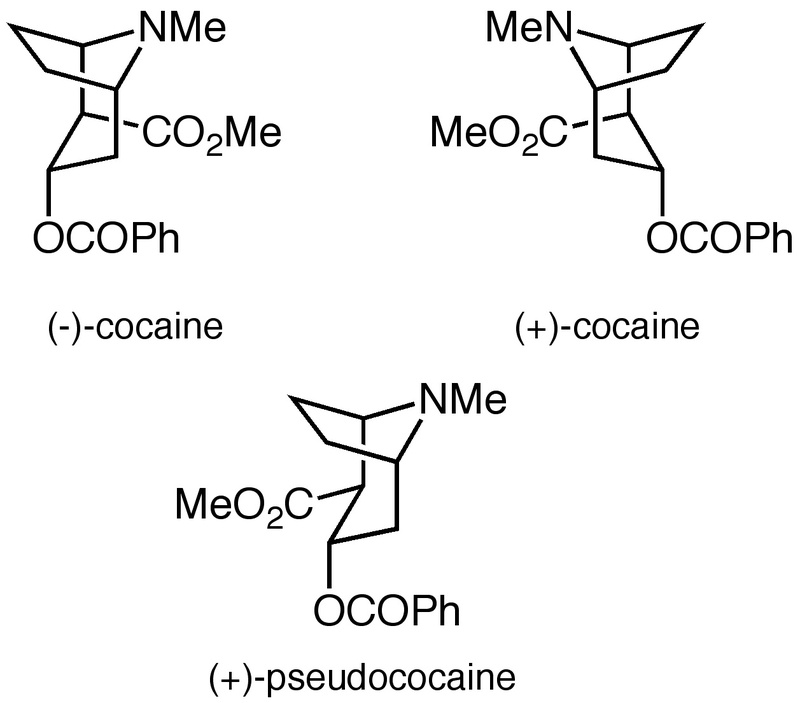 Davies and co-workers at Oxford have now published a short and elegant synthesis of (+)-pseudococaine, a diastereomer of natural (-)-cocaine. 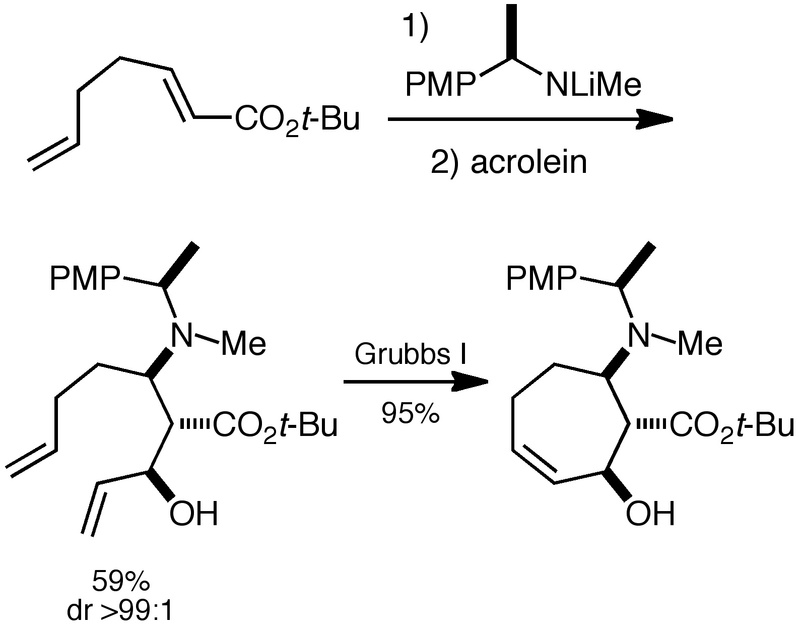 It’s worth pointing out that intramolecular iodoamination reactions of simple primary and secondary amines can be problematic due to N-iodoamine formation and subsequent shenanigans, including potential post-cyclization aziridinium ion formation. Davies’ reaction is well-behaved, since transannular iodoaminations are especially favorable, the amine is tertiary, and the product is not susceptible to aziridinium ion formation. 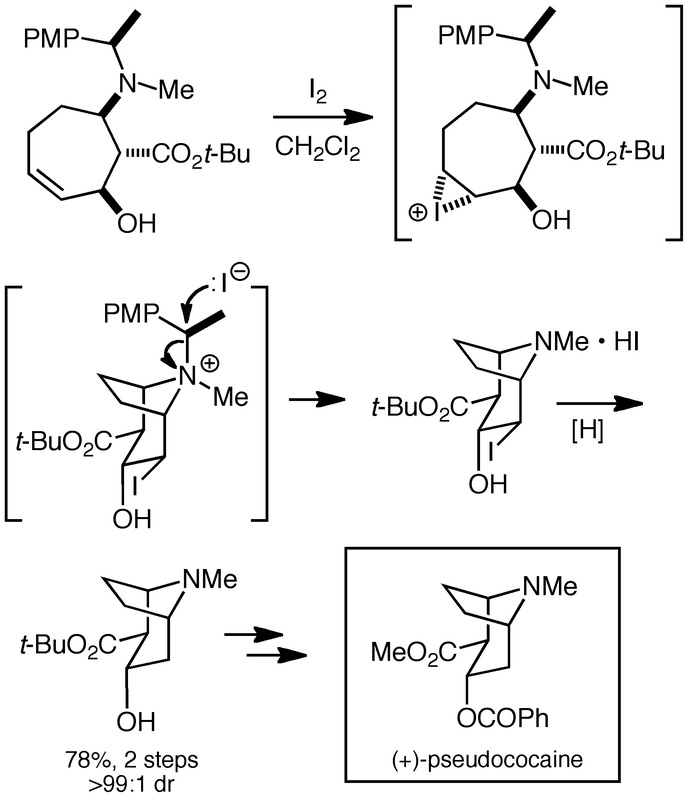 The cyclization precursor is made by a very nice sequence involving conjugate addition of a chiral lithium amide to an enoate with subsequent in situ trapping of the enolate by a diasteroselective aldol condensation (7% of the other aldol diastereomer is not shown). I always get excited when I see an unexpected glowing spot on a TLC plate. Fluorescence! I’ve sent many a graduate student on a wild goose chase to try to identify the source of that glow. My curiosity about these compounds blossomed during my time in industry, where we worked on fluorescent compounds and quenchers of fluorescence. Adding to the fun was the fact that most small-molecule fluorophores (as opposed to materials like quantum dots) are heterocyclic compounds. Let’s look at a current application of fluorescent heterocycles and then a bit of chemistry. Check out this recent TEDMED talk by Quyen T. Nguyen, M.D., a Professor of Surgery at UCSD, who gives an entertaining talk on the use of fluorescent dyes to aid in finding and removing every last bit of a tumor. Her collaborator, Roger Tsien, received the Nobel Prize in Chemistry in 2008 for his work on green fluorescent protein (GFP). In this work, cell-penetrating peptides (CPPs) composed of polycationic sequences of 6-12 consecutive arginines are covalently attached to a fluorophore (Cy5, more on that later). These labeled CPPs can penetrate into pretty much any mammalian cell without requiring specific receptors. To target them to the tumor, they make activatable CPPs (ACPPs). Generalized cellular uptake of the CPPs is blocked by fusing them to a polyanionic peptide domain (featuring glutamates) via a protease-cleavable linker, neutralizing the polycation domain via the formation of an intramolecular hairpin. For specificity, the linker is designed so that it is cleaved by certain matrix metalloproteinases that are overexpressed in tumors. After injection, the ACPPs travel to the tumor, are cleaved by the proteinases, and accumulate in the adjacent tumor tissue. Shine some light on the area and you can see the tumor, including the normally difficult-to-find margins. Great stuff! What are the fluorescent dyes being used? Nguyen and Tsien use indocyanines (or simply “cyanines” for our purposes), which have been long-known for their fluorescent properties and are popular for photography, laser printing, non-linear optical materials, and of course labeling biomolecules. They have the typical push-pull electronic structure of many fluorophores; the conjugated system has an electron donor at one end and an acceptor at the other. Back to Nguyen and Tsien: Take a look here and here for some of their work. For many of their applications, they use Cy5 (originally Pharmacia Biotech, now GE Healthcare), a pentamethine cyanine dye shown in the scheme below, which absorbs at 650 nm and emits at 670 nm in the red region of the visible spectrum. This is well beyond the region of background fluorescence that is found in tissue, so the signal-to-noise is good. They’re also quite bright. Another advantage of these long-wavelength emitters is that the light can travel through quite a bit of tissue. How are cyanine dyes made? The venerable Fischer indole synthesis is used to make the 2,3,3-trimethyl-(3H)-indole starting materials. N-alkylation with an alkyl halide produces a salt, which is used in an aldol-like double condensation reaction with 1,1,3-trimethoxy-2-propene, an equivalent of malondialdehyde. 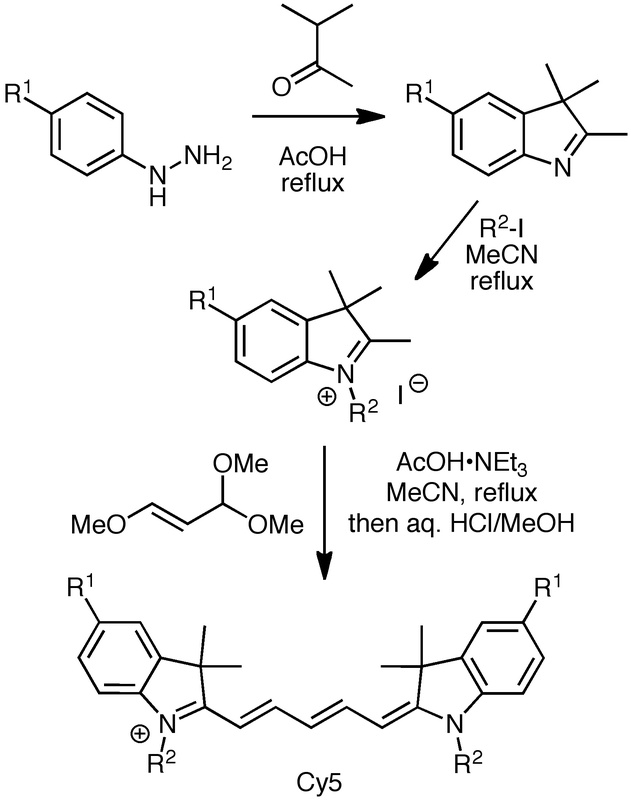 If you would like to learn more about the chemistry of cyanine dyes, take a look at Mojzych and Henary’s review on the synthesis of cyanine dyes, or if you can’t access that, download the thesis of Jamie Gragg, who has a nice historical overview of the discovery and development of cyanines. If fluorescent heterocycles interest you, check back here for occasional posts; there will be more!